SKIP TO MALOU: Go IZZY! "OH- MY- Gosh, OH My Gosh" was the scream I heard from the living room. It was almost midnight and I just tucked myself in bed and about to enjoy the warm comfy sheets, when I suddenly heard my daughter scream. Instinctively, I ran out to check what was going on. I saw my daughter gasping for breath. "I got an A in Calculus II mom!" she excitedly informed me. "I was trembling as I was typing my password" she said anxiously. "I'm sorry did I wake you up?" she quickly added apologetically, as she saw me wipe my eyes. "But you know this means so much to me" she explained further. My daughter Izzy is very reserved but her scream was an indication of profound joy. I hugged her tight and I could feel her heartbeat beating so hard and fast... I hugged her even more. I didn't utter a word we stood there hugging each other in the middle of the night Just the two of us standing in complete silence. Of course I know what getting an A in Calc II means to her. As a senior she's all focused on her college apps, And I've seen her work hard. I want her to realize that hard work pays off... and I'm glad it did. I hugged her tighter because I want her to know that I share her joy and excitement! Silently praising God. Grateful to have such wonderful kids such as Izzy. A few weeks later, one early morning as I was packing lunch for my kids, I heard her exclaim "No way... No way!". I saw her face glow when she muttered in disbelief: "I got in mom." I ran towards her, with water dripping down my hands, and found out that she was included in the first batch of accepted students for a nearby university. I jumped for joy with her... Even if this is a reminder that she will be leaving us for college soon, I guess I have to be ready to set her free... and even if she's the second daughter for me to send off to college, it will never be the same without Izzy around the house. But yeah we have to let them go... we have to let them discover their own future... but hopefully, they bring with them the love, the values and the faith that we parents have instilled in them. In order to celebrate Izzy's good news, I want to share with you the recipe for CHICKEN CURRY Trilogy. Why the "trilogy"? You'll find out below. Enjoy! In a wok, saute garlic and onions in cooking oil. Add chicken and cook it for about 5 minutes or until slightly brown. Add a dash of pepper. Pour the first can of coconut milk together with the chicken stock. Let it simmer until the chicken is tender. Spice up using the curry powder. I like to make my curry rich and flavorful so I used around 3 round table spoons. You may want to add 2 tbsps first and adjust it according to your taste. Add the potatoes and the carrots. Pour the other can of coconut milk and stir frequently. Add the green bell pepper. Season with salt. But for my curry, I used patis (fish sauce) to season it. The sauce should be thick and creamy. Preparing chicken curry does not end here. You have to serve condiments that go with it. 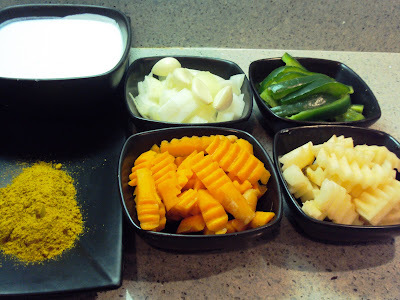 My hubby is always requesting for chutney, although I still have to come up with a good recipe for it (please let me know if you have one). For him, curry isn't complete without it. 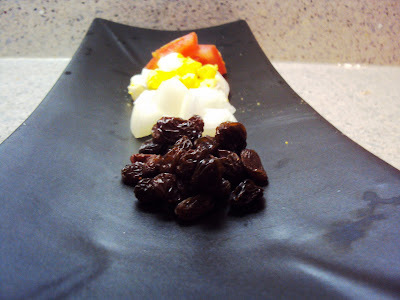 He wants the whole ensemble, which consist of: raisins, chopped onions, chopped boiled eggs, mango chutney and chopped tomatoes. 1. on a bed of steamy linguine . 2, on a toasted pita pocket. 3, on steamy white rice. The pita pocket which Izzy picked was delectable. 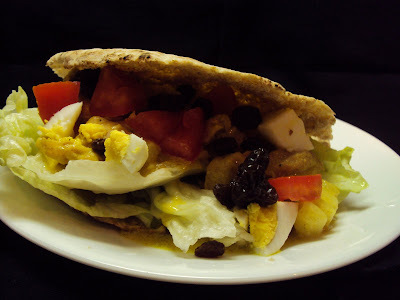 She enjoyed the crusty-ness of the pita pocket bread and the gooey sauce oozing out of the bread. It was finger licking good for her. So take your pick... Choose the carb bed you want to put your chicken curry on... Or you can share all three dishes with your family for an even more meaningful meal. I'm pretty sure you'll savor the moment... just as we did when the moment called for a celebration! This looks stunning. I will never look at curry the same way again! 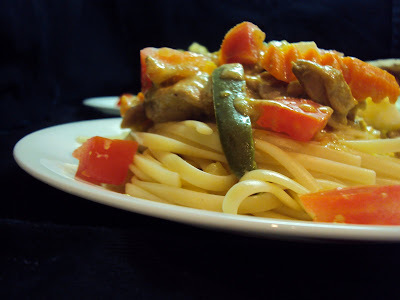 I would have never known that pasta and curry would be a great food profile combination!!! I want them all! But if I had to choose, I'd hang with the guys: it's tough for me to give up rice - love the way those grains soak up the curry sauce. But linguine and pita sound fantastic, too. Ooo, tough choices! I'm so happy for Izzy. Her hard work really paid off. You're one of luckiest moms I know because you have such wonderful kids. I've never had chicken curry with linguine and pita bread before but I'm always willing to try something new. I love the pics...it's making me drool. You've just made chicken curry more interesting. Great post as always! Thank you for stopping by... and for the kind words! Readers like you inspire me to continue what I love doing. Thank you for always being there... Keep reading! TN: I had rice with the leftover today and it was mmmm good... The sauce makes you eat more rice... YUM! Awww that's sweet of you to wish my Izzy the best of luck... thank you for being so kind! Thank you cookies and cream! 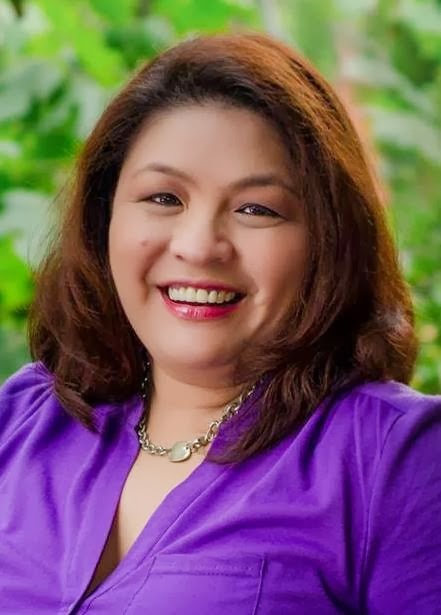 You are one of the "regulars" of Skip to Malou and I would like to thank you for being there always... it's comforting to know that I have readers like you... for real! Keep Reading! Congratulations to Izzy. This is wonderful. She must be an amazing young lady. I just went to vote for both your recipes. That meatloaf makes quite a picture. I am going to put the adobo on my blog. I can't put the meatloaf because it is not kosher. Neither is the adobo but it can be made with chicken so I will be happy to put it up. Check it out when you have a moment. I have been thinking of making the adobo with the chicken. It sounds just so good. Thank you for being so kind Chaya! VOting for my entries at foodista is the sweetest thing and I truly appreciate it. 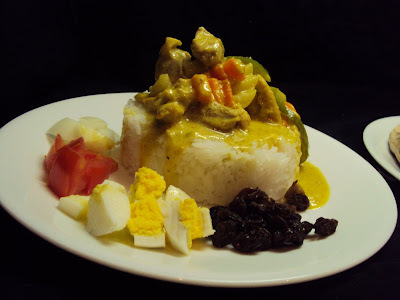 I am looking forward to see my adobo on your blog, an soooo thrilled. THank you! Congratulations to Izzy. Your post made me smile. Kids grow up so fast. I dont have any but I do have a nephew and niece that are growing up extremely fast. The curry looks amazing. I am sure it tasted amazing too. It's a guy thing as your son said so I'm sticking myself with the curry on a bed of rice. Yummy! Super congrats to your daughter! That is SO exciting. I remember when I first got accepted to college...I practically danced around the house. I'm so sure she has worked hard and deserved it. The Nomadic Pinoy: I'm glad you found your way to my kitchen... thanks for stopping by! Joanne: I'm thrilled to let you know that hopefully my daughter shares the same field as you do! Thanks for the best wishes. I will let her know! Congratulations to your daughter! What a fun post. The curry looks so delicious! I've never made curry myself, but I love to eat it! I'll have to give your recipe a try. Im glad I was able to put a smile on your face... that's heartwarming to know. I will delightfully cook the curry for you in exchange with those twinkies haha! hello malou!! thank you so much for the lovely comments! i beleive ye blog is as informative as mine!! so creative and beautiful! keep up the great work!! m loving the delicious recipes!! Great to see you again. I will make that Mayo I promise! Congratulations Malou and to your daughter Izzy - even if I graduated from University many many years ago - I still remember the angst that I felt when waiting for by test and acceptance results! Well done for raising a wonderful daughter and well done on the lovely chicken curry!! you are a genius in the kitchen! love this post! Huge congratulations to your daughter! 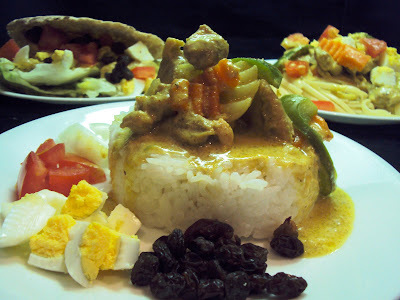 I love your curry and the three ways of serving it, so very creative! Hi Natashya: Thank you so much... im thrilled as usual to have you! I choose the rice! I love drenching it in the sauce. YUM!!! 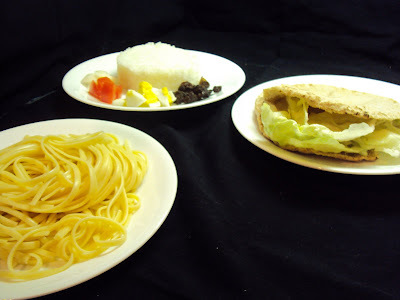 I've always heard of pasta served with curry but never tried it myself. I'll have to give it a shot one of these days since it's highly recommended by you! HI Cynthia! I'm glad that you like my new header. I bowed out as a diva but I skipped to malou haha! Hello Dhale great to see you in the house again. How's your trip going? You've been so kind to me Dhale and I truly appreciate your "support"... keep coming back ok? I also tried the rice and you know what, it's still the number one choice haha! UHM WOW I wish my mom made me dinner three ways every time I got an A in my class!!! What a smart daughter you have, it is so impressive to see her dedication and passion to not only excel in school but to succeed within herself. My mother was so sad when I left for college, but within two years of coming back she had managed to clear out my room and remodeled it into her office hahaha. Delicious curry, and best of luck to you and Izzy through her college adventures! Turning your room into an office??? LOL! But I'm sure there's a day bed for you to sleep on when you visit haha! I love your family stories JOY! Have fun visiting your folks this weekend! I remember those proud moments well. It's so wonderful to know that your daughter is accomplishing so much! She going to have a bright future ahead of her. Thank you for the kind words and the best wishes Christine!